Jem Hall is heading back to Brazil from 22 November -12 December 2018 for his windsurfing wave sailing pro coaching clinic to once of the very best wave sailing venues - Jericoacoara. The Brazil Peter Hart Windsurfing Wave Sailing Masterclass is from 08-18 January 2019 offers pro coaching on easy waves and less crowded conditions in January in the amazing venue of Jericoacoara. Awesome days and mellow nights. Check out the conditions from Peter's Video footage from the Jericoacoara, Brazil windsurfing pro coaching Masterclass clinic weeks in 2017 and 2018 with Sportif. If you're looking to get into wave sailing and enjoy a stunning group holiday location. But hurry there's limited places available. The Peter Hart Masterclass windsurfing clinic to Mauritius is from 19-29 November 2019. Improve your general skills and wave sailing skills staying at the 4* Le Morne All inclusive hotel on the spot. See the VIDEO of the conditions here. Head to Tobago in the Caribbean and get a FREE windsurfing and kitesurfing instruction sessions and Pay 1 Get 2 Weeks Rental on selected dates. Plus a host of other activities are now available. Check out our spot video to see the amazing conditions. Book your next Caribbean windsurf or kitesurf holiday to Cabarete in the Dominican Republic with new centre where you can rent latest Duotone Kitesurf and windsurf equipment, take some instruction plus enjoy SUP and surfing. Newly featured for 2019 are the 4* Budha Beach boutique hotel, Marine Club Beach Roest and the 5* Iberostar All Inclusive resort in the Cape Verdes. Choose Sal Island or Boa Vista for a mix of flat water and wave conditions just a short flight from the UK. The Simon Winkley Pro Coaching windsurfing clinic to Lanzarote in the Canary Islands from 18-25 March 2019 is for Intermediate to early-advanced windsurfers. Covering everything from beach and water starts, tacks, gybes and more advance skills conditions. For 2019 Fanatic pro coach, Tom Brendt has 3 venues for training for beginners +, intermediates and advanced sailors - Tarifa in Southern Spain 15 - 19 May 2019, Fuerteventura in the Canary Islands 2-9 July 2019 and the Greek Island of Kos 22-27 August 2019 and 29 August - 03 September 2019. Peter Hart 2018 Windsurfing Masterclass in Greek Island of Rhodes is 12-19 June 2019. See Peter's review of the conditions, what's included and VIDEO here. 1 LAST SPACE ! New for 2019 are 7 and 10 days Jem Hall Mauritius windsurf clinics from 27 October to 11 November 2019 to Le Morne in Mauritius. Book soon - as there are just the LAST FEW PLACES! Kitesurf Camps to Dakhla, Morocco with 3 x World Champion and UK professional coach, Kirsty Jones. Flight, hotels, transfer and pro coaching packages. Fun, group holidays ideal for solo travellers for 1 week with extensions possible. DATES Dakhla Lagoon 02-06 June 2019. Book your next surfing, stand up paddle boarding, bike, MTB or yoga programme to Portugal with Sportif. Staying is a luxury 4* beachside hotel with fine dining restaurants, spa right by a beautiful beach and historic town, Viana do Costello. The new Surf and Dive Lodge at the Sham Safaga in the Red Sea is now on sale with Sportif Travel. Book your next windsurf, kitesurf, SUP or diving holiday. Right next to the beach and sailing spot! Join Jem Hall for his 2019 Tobago Windsurfing Ultimate Boost Spring tune up clinic. Progress your water starts, gybes, tacks, freestyle and jumps for one or two weeks! Week 1 05-12 February 2019. FULL Week 2 12-19 February 2019. The Marsa Alam Windsurf and Kitesurf Centre at the Equinox All Inclusive Resort has new 2019 kit! Test out the JP Super Ride boards. 2 FOR 1 OFFER SAVE 50% Book 1 windsurf rental board and get the 2nd FREE. Plus special discounted rates in on holiday bookings to the Sham Alam Hotel in Marsa Alam on the Red Sea from December to February. Looking to learn to kite foil or wind foil on your next holiday. Sportif Travel can offer over 25 resort with the latest wind and kite foiling equipment to take wind or kite foiling lessons. Learn in the best conditions from the professionals. Plus you need less wind to foil so there's a destination and any time of the year to learn. Call us on +44 (0)1273 844919 for the latest information. NEW Spot video of the windsurfing and kitesurfing, flat water, uncrowded sailing conditions at Marsa Alam, Red Sea. 4* All inclusive hotel with centre on the spot. We love it! Check out this latest Video Dakhla the most incredible flat water lagoon. Ideal for all levels of windsurfer, kitesurfer with surfing and stand up paddle boarding on offer. Plus you can join Kirsty Jones on her Kitesurf Camp Experience weeks in September/October 2018. Sportif Travel have an immediate job vacancy for an experienced kitesurfer /windsurfer for a new role as Travel Consultant based in the UK, advising on our amazing kitesurf / kiteboarding and windsurfing holidays around the world. We've been down to Dakhla to see this brand new windsurf, kitesurf and surf camp with an onsite centre in Dakhla, Morocco. Check out the very latest information on this amazing new spot - with flat water and waves and spots for beginners to experts. Check out our report on the windsurfing sailing areas and windsurf centre facilities in El Medano, Tenerife. Windsurfers have the choice from three sailing areas and can try out the latest equipment from 7 different manufacturers. Enjoy a 3 day, 2 night safari at Kruger National Park before or after your windsurfing, kitesurfing or stand up paddle boarding holiday in Langebaan, South Africa with wine tours and Cape Town available too! Looking for a combination of windsurf and cycling or moutain bike off-roading on your next Greek Islands holiday? See the Sportif Guide on where's best to go with specialist cycling and MTB rental and services available from your windsurf centre. The new Bjorn Dunkerbeck Pro Centre in Bonaire offers conditions, instruction services and rentals suitable for all levels! Our Greek Island destinations are chosen for their quality of windsurfing and kitesurfing conditions with a number resorts to choose from to suit all tastes and budgets. Check out the new 2018 spot video from Jericoacoara Brazil with the lastest windsurfing and kitesurfing action on and off the water. Our newly feautred 5* Hilton Resort in Sal, Cape Verde Islands is located directly on the beach. The hotel offers a range of facilities including a swimming pool, fitness room and beauty salon. Sotavento, Fuerteventura offers kitesurfing holidays in one of the most famous venues of Sotavento beach. Check out this 360° video to see what it has to offer! The windsurf and kitesurf centre in Boa Vista has brand new 2018 kit and newly refurbished centre. Check out this video showing the sailing conditions from the centre to have a good look at what’s on offer! It's Tobago Time. The Caribbean season is in full swing. Even though Peter Hart and Jem Hall clinics are sold out for this year (sign up for next year now) you can get still down to Tobago for some superb flat water windsurfing and kitesurfing at some great prices before the end of the season. See our video the windsurf sailing conditions at of our newest winter destination - Langebaan, South Africa. Flat water, waves and superb wind conditions from October to April. Head to Langebaan in South Africa. With flat water lagoon - ideal for all levels and nearby wave sailing locations. The season starts in October with wind through to April. Check out the conditions on this video. The story of how the inspiring Life movie came about set in Brazil with amazing scenic shots of Jericoacoara, Icaraizinho, beaches, windsurfing action and feel the vibe - you'll be there. View the video here. Alacati in Turkey, has long been on the PWA, the Professional Windsurf Association, tour. See where the best in the world enjoy fantastic slalom conditions in August with these videos. Sportif Team Member, Oliver, has been down to El Gouna, Red Sea to check out the conditions, hotels and what's on offer off the water. See his report on the kitesurfing beaches and new windsurf location. Great for solo travels, families and groups. Check out this interview with Sarah Quita Offringa who won the PWA Slalom Windsurf Event in Alacati four years in a row from our partner centre, after taking a 2 week holiday there. The Windsurf and Kitesurf Centre Equinox, is one of our newly featured Red Sea centres. Located in Marsa Alam the centre is situated on the beach of the 4* Three Corners Equinox Hotel, just 30 minutes from the airport. From Spring 2018 wind foiling and kite foiling rental, private and semi private lessons will be available at selection of our centres! The windsurf and kitesurf centre in Golf de Roses, Spain, featured their first Xperience Windfoil event from 22 to 29 October. Our kitesurf centre in Tarifa, on the southern coast of Spain, is now offering kite foil rental, private and semi-private lessons! Now available are these self catering apartments on the Caribbean islands of Bonaire overlooking the famous flat water and world class PWA freestyle venue of Lac Bay. Sol Beach House is a 4*, modern, relaxing hotel, located ideally for exceptional winds, superb sailing conditions and the first class windsurf and kitesurf centres, opening 15 December 2017 with 25% OFF. Sportif Team Member, Oliver, has been down to Essaouira, Morocco to check out the conditions and hotels. See his report here from his windsurfing trip this month. Kefalos on the Greek Island of Kos, is a superb windsurfing location. Ideal for all levels with sailing, SUP - stand up paddleboard, yoga and kitesurfing close by for independent kitesurfers. Check out this video from the centre. New for 2017/18 Windsurf and Kitesurf Holidays to Langebaan and Cape Town. We've great early booking offers so call us for the very latest information on hotels, sports, safaris and wine tours. Prices start at £949pp for one week including hotel, flights & transfers! Exclusive watersports excursion to the Gibraltar Strait are now available from our Windsurf and Kitesurf centre in Tarifa, Spain. Plus longer week long sailing trip from Mallorca. Sail, windsurf, kitesurf and SUPin for all levels on a group holiday this September 2017 - ideal for solo travellers. Club Anemos, the home of the windsurf centre in Karpathos, new refurbishment has created a great spot for windsurfers and non- windsurfers to relax, socialise and enjoy the views. We've teamed up with PWA Pro and European Freestyle Champion Adam Sims to offer a brand NEW Fuerteventura windsurfing clinic from 15-22 July 2017. The clinic includes 6 days of coaching, at Sotavento. Check out his video of the conditions here. Thinking of the Greek Islands for your next windsurfing or kitesurfing holiday. Check out our guide the best spots, the conditions, hotels and other activities available. Check out this video from Jem Hall about his flat water clinics shot in Prasonisi on the beautiful Greek Island of Rhodes. Sportif visited Mykonos last summer and are now offering a choice of 4 hotels on the spot with the Fanatic windsurf centre providing full rental and instruction programme. With local tavernas, beautiful beaches and superb conditions, we highly recommend Mykonos for your next summer holiday. The Mountain Bike facility at our windsurf centre in Crete has a range of latest MTB equipment and organises guided tours. Costa Teguise on the south west Lanzarote coast is ideal for active families. The sandy, sheltered beach launch is ideal for windsurfing beginners, children, surfing, SUP plus there's golf and a whole range of fun activities to enjoy. Looking for a family windsurfing and kitesurfing holiday location next summer. Here are our top recommendation for hotels and accommodation with superb centres close by. Where's the best place to learn to Kitesurf? We get asked this a lot and we recommend these resorts. Watch Fanatic riders Klaas Voget and Victor Fernandez ripping in legendary One Eye, at Le Morne in Mauritius on a day to remember! Kitesurfing Video tutorials from the North Kiteboarding Academy help to learn to kitesurf and improve your technique. You can hire North equipment and book learn to kitesurf lessons to advanced kitesurfing technique instruction and courses with Sportif Travel. See our guide to the different windsurfing and kitesurfing spots in Brazil, when's best to go plus a Ride of the Day VIDEO with footage of the conditions. NEW for the 2016-2017 winter season - our selection of boutique, pousada accommodation in Icaraizinho, Brazil. Stop off on the way to Jeri to enjoy flater water, easier waves, uncrowded beach and laid back atmosphere. Video highlights of PWA winner Victor Fernandez masterfully windsurfing those waves in Tenerife and Pozo 2016 Canary Island professional championships. Amazing video footage from Caesar Finies Pro windsurf freestyle/flowstyle on Lac Bay, Bonaire. Cyprus - our newest Mediterranean destination is perfect for year round sports and activities. Enjoy windsurfing, kitesurfing, scuba diving, golf, tennis, cycling, sailing, football, fitness, yoga, swiming and Ironman training staying at our specially selected luxury spa and boutique hotels. This multisport package allows you combine windsurfing, kitesurf, surfing and SUP in one holiday with instruction and rental included for £355 in April, May and October - SAVING £££s! Mauritius multi sport packages for windsurfing, kitesurfing, surfing or SUP with rental for a week and one lesson per day in each sport in January and February from £305all in! This multi-sport, combined rental and instruction package for windsurfing, kitesurfing, surfing and SUP offers complete flexibility. 1 week from £355 includes 1 weeks' rental for each sport and daily instruction package for 5 days. Combine windsurfing, kitesurfing and SUP in Safaga in December, January and February with 6-7 days of rental and one lesson per sport each day for 5 days for £355! New for 2016, integrated fitness, triathlon and biking camps from November 2016 to April 2017 in Cyprus with Sportif Travel. Intensive kitesurfing strapless courses are now available in Essaouira, Morrocco. In a five day course you’ll get instruction on strapless kitesurfing, SUP and surfing. Awesome conditions, amazing resort staying in local Riad or luxury hotel accommodation. Learn from a surf professional with over 25 years of experience in Essaouira, Morocco with lessons for all levels. Book 2 hours and get and extra hour for free! The Natura Park Village all inclusive spa hotel at Psalidi, Kos has many activities and facilities including a windsurfing and kitesurfing centre on the beach, just 10 minutes from lively Kos Town. NEW for this summer, a new watersports centre and 4* beach front all inclusive luxury Caravia hotel in Mamari, Kos. Situated on a 1km long sandy beach with watersports centre offering rental and tuition, kids clubs and activities throughout the day, this is the perfect location for families and those who enjoy fine dining. If you're looking for a Greek Islands learn to kitesurf spot or centre for your Kos holiday, see this Greek Islands Kitesurfing Guide with all the info on kitesurfing sailing conditions, centres, rental and instruction available. Try the new light, windsurfing I-Rigs from North Sails in Dakhla, Fuerteventura, Golf de Rosas, Maurtius and NEW Teos this summer. Super lightweight, fully inflatable, easy to use rigs for all ages. It's perfect for leaning to windsurf. Sportif are pleased to announce their latest selection of boutique, local style Pousadas to add to the many budget to luxury hotels we have on offer in Jericoacoara - Jeri Brazil. Now there's even more choice for the 2016 - 2017 season! This multi-sport, combined rental and instruction package for windsurfing, kitesurfing, surfing and SUP offers complete flexibility at Essaouira Club Mistral centre all year round at £305 for the week! New for 2016, we are pleased to announce 2 new boutique beach side accommodation. Hotel Villa Taina and the Beach Palace luxury apartments. Right on Cabarete beach and minutes to the centre. See photo galleries & VIDEO here. Head over to Dakhla, Morocco for the opportunity to take Yoga classes with World Champion Kitesurfer Kirsty Jones who is also a qualified yoga teacher! Book now for daily yoga classes, 'SUP Yoga' plus the Kirsty Jones Experience workshops. The centre at Golf de Rosas, on the beautiful northern Spanish Costa Brava coastline, is opening on 25 March 2016. Get booking now as places are filling up fast. New for 2016 is Air - foiling. Get that flying feeling event more! See our Guide to St Martin in the Caribbean. Flat water and waves - windsurf, kitesurf, surf and SUP. With great facilities for children and families. The Santa Monica beach hotel in Costa Calma, Fuerteventura in the Canary Islands with kid's club and windsurf & SUP centre on the beach offers rental & instruction sports packages, ideal for beginners and children. If you're looking for maximum hours on the water the NEW Full Ride Combi Package in Dakhla is for you. Book 14 hours of Semi Private Training with 1 week's rental and SAVE over £150! Peter Hart, expert UK technique writer, sports coach and all round windsurfing 'Guru', visited the now famous spot at Le Morne in March 2005. These are his impressions of one of the best flat water and wave destinations in the world. Want to see what it's like to kite in Rodrigues? The North Kiteboarding team have been down to this amazing Indian Ocean island to test the latest Evo 2016 gear. See this video of the conditions and their out of this world riding. NEW luxury boutique hotels at Anse Le Raie north Mauritius. Amazing flat water lagoon conditions. Choose from family All inclusive or luxury boutique hotels for your perfect holiday. Special 2 FREE NIGHT offers available. The Season has started in Sal, Cape Verdes with choice of windsurfing and kitesurfing beaches and centres open and ready for business. SPECIAL OFFER discounted windsurf & kitesurf rental in Oct & Nov.
See this windsurf and kitesurf video footage of Cabarete in the Dominican Republic from the NEW Sportif Travel You Tube channel. Now available to pre-book, NEW kitesurf excursions and downwinder packages in Mauritius Le Morne. Explore the flat water lagoon at Ile aux Benietiers or jumping and small waves at Bel Ombre. 2 hour to half day excursions available from £20! Get windsurfing, kitesurfing, kayaking and SUPing at the 2015 National Watersports Festival at Hayling Island on the south coast of England from 4-6 September 2015. Sign up and join the fun with events, camping, clinics, taster sessions, night races and ledgendary parties. There's camping available so you can make a whole weekend of it! New luxury Bonaire windsurf and kitesurf 4* and 5* boutique and luxury spa hotels and apartments with a la carte dining, spa faciilties and great beach locations near the windsurfing and kitesurfing. Newly featured luxury 4* boutique hotel - Can Pico with private pool and a la carte dining a short distance from the windsurfing and kitesurfing beach. The Maurutius Attitude Freeride Challenge 2015 competition for windsurfers & kitesurfers 4-11 Aug 2015. New Kirsty Jones kitesurf camp in the superb wave sailing spot of Famara in Lanzarote. 2 days of coaching plus cyoga, excursions and sociable group dinners. Ideal for solo travellers. Improve your Kitesurfing technique from UK Champion and one of the very best professional coaches. Newly featured for 2015 Luxury hotels in Morocco beach resort of Essaouira with windsurfing, kitesurfing, surfing, SUP. And now you can extend your trip at the beginning or end of your holiday with luxury hotels in Marrakech too! Souks, Spas and Surf the perfect combination. Sportif are now offering mountain bike hire and tours from the Scott MTB centre on Karpathos Greek islands plus combi windsurfing and climbing package. Peter Hart headed back to Safaga for his Masterclass windsurfing clinic in April with Sportif. See the report here. With windsurf, kitesurf and SUP in Costa Calma and Risco del Paso beaches near Sotavento, Fueteventura there's even more choice of where to sail. All offer the latest windsurfing and kitesurfing equipment from Fanatic and North plus rental and instruction with new apartments and hotels on the spot. See these latest photos of the windsurfing and kitesurfing conditions at the Sotavento Lagoon, Fuerteventura in the Canary Islands. Newly featured luxury 4* Blue Ocean Resort, Mui Ne offers an excellent stand of accommodation with kitesurf centre and launch directly on the beach in from of your hotel. Combine with a tour of Vietnam's cultural hightlights from £499pp. 2 new hotels are opening in Le Morne, Mauritius - the 4* Coral and 4*+ Coral with windsurfing and kitesurfing Fanatic and North centre on the spot with the latest 2015 equipment and flexible rental and instruction packages. Choice of restaurants, spa and kid's clubs. Family friendly options to the Red Sea, Mediterranean, Canaries, Spain, Turkey, Mauritius or the Caribbean with child friendly kid's classes from 6-11yrs and 12-15yrs with professional instructors and centres on the beach by your hotel. New Hotel & JP Neil Pryde Windsurf Centre and Cabrinha Kitesurf Centre opening February 2015 in Hurghada, Red Sea. Jem Hall 2015 Windsurfing Clinics to the Morocco and the Greek Islands are nearly sold out. Moulay 18-25 May 2015 Wave Sailing Clinic has 1 SPACE left and Prasonisi in Southern Rhodes has 1 SPACE. NEW Tobago now on sale but booking fast! See the new Dreams video of windsurfing and kitesurfing in Jericoacoara and Icaraizinho, Brazil from Club Ventos! Jericoacoara, Brazil continues to be one of our most popular windsurfing and increasingly kitesurfing destinations. Now we have an even greater selection of luxury boutique pousadas and hotels. See our review of our recommended places to stay. Read this Windsurf Magazine travel review of Icarazainho, the little sister to Jericoacoara (Jeri) in Brazil. Not as well known but less crowded and more gentle conditions. Just 2 hours from Foraleza aiport on the way to Jeri, it's the perfect warm up. Arrive in Jeri ready to rip! The Windsurfing World Cup in Alacati takes place every August. See the archive 2010 footage courtesy of the PWA. Windsurfing videos from the Sportif archive of Gostoso, Brazil, showing the centre, hotel and the windsurfing and kitesurfing conditions. The 2014 National Watersports Festival at Hayling Island is from 5-7 September 2014. Sign up and join the fun with events, camping, clinics , taster sessions, nigh races and ledgendary parties. The new windsurf centre in Tenerife offers the latest windsurfing equipment from Fanatic, JP, F2 and more. All available for you to test out! In Marsa Alam the renovations on the Shams Alam hotel are complete. The hotel has newly refurbished bedrooms and landscaping. Marmari on the north coast of Kos has both flat water and bump & jump windsurfing and kitesurfing conditions. Your next summer Greek Islands holiday? Kitesurfing action video from El Gouna in the Red Sea. Amazing flat, turquoise water at Magroovy Beach. New Tarifa Training Event in 23 - 30 August 2014 in the Wind Capital of Europe. Kitesurfing, Windsurfing, SUP, Fitness and Excursions for all levels. Want to know what happens on a Kirsty Jones kitesurfing camp in Dakhla, Morocco? Then read this review by Kirsty herself with comments from happy kitesurfers who have been. Thinking of a learn to kitesurf course or holiday, then why not choose a Sportif destination with great hotels and professional kitesurf centres on the spot with flat water conditions, warm water and sunshine to help you progress quickly! New Family, Boutique and Luxury Hotels in Lanzarote, Canary Islands. Great value and superb wind with choice of self catering or all inclusive options. Get your kid's into windsurfing, kitesurfing and SUP with our junior 'Surf'n Play' camps throughout the summer in Spain. Taster sessions in small groups for 8 to 12 year olds. Learning to Kitesurf Video from Club Mistral, Golf De Rosas, Spain. For windsurfers and kitesurfers wishing to get married or honeymoon and windsurf too, call Sportif for choice of top destinations such as the Plantation Beach spa resort in Nevis, Caribbean. FREE Wedding Package. Yoga Classes are now available at the Club Mistral Santa Maria on the beach. The 2014 PWA Windsurfing World Cup calendar includes Sotaventor, Gran Canaria and NEW Tenerife and Bonaire. See some fantastic video footage of Pigeon Point in Tobago. El Yaque photos from the centre, beach on water action. The 2014 PWA Windsurfing Freestyle and Slalom World Cup event takes place 22-29 March 2014. See this Video of Windsurfing in the beautiful spot of Sigri on the Greek Island of Lesvos. News from Kirsty Jones Sportif Kitesurf Wave Camp in Dakhla. Sign up for 2014 - dates coming soon! See this Video of Peter Hart's 2012 & 2013 Windsurfing Wave Sailing Masterclass in Jericoacoara, Brasil. Join Peter in Jan 2014 for entry level wave sailing and general skills. Head to Jericoacoara in Brazil to try out the brand new JP-Australia and Starboard boards which have just arrived! New upgraded facilities at the Windsurf Centre - Palekastro Bay, Crete. See our travel report from our partner centre, Club Mistral from the amazing Caribbean windsurf and kitesurf holiday destination of Cabarete in the Dominican Republic. PWA video from the 2009 and 2010 archives from Ponta Preta, Sal Cape Verdes at the windsurfing World Cup. Live video kiteboarding coverage of the 2013 PKRA World Cup from Sotavento in Fuerteventura. Slalom action from the 100th event celebrating over a decade of kiteboarding events! Video highlights of the 2013 Windsurfing Freestyle World Cup and Kiteboarding Grand Slams. See junior British kiteboarding competitors Guy (15 years) and Tom Bridge (12 years) in action at the PKRA Youth World Championships with Tom bringing home the title for the GB! Check out this video from Team Fanatic & North in Brazil from Josh Willmot with Andre Paskowski, Max Rowe and Gollito Estredo in Jericoacoara. See Vikki Allinson in action in Dakhla, Morocco after a fantastic kitesurfing camp with Kirsty Jones. Bonaire Kite Event in June 2013 with Aaron Hadlow, Sam Light, Billy Parker and Lewis Crathern. See these Aruba videos from the Tourist Board to help you plan your windsurfing and kitesurfing to this Dutch Caribbean island. Here's our latest travel report from the centre in Cape Verdes for your windsurfing and kitesurfing holiday. 25th Anniversary of PWA contest in Gran Canaria. From 9-14 July 2013! Head out to Bahia Feliz for a windsurfing holiday and check out the action. See the highlights from the PWA 2012 event here. Check out the sailing conditions, windsurfing and kitesurfing in Keros Bay on the Greek Island of Lemnos. Superb flat water ideal for beginners, learn to windsurf, learn to kitesurf, stand up paddle boarding and sailing. Girls Windsurf & Kitesurf coaching weeks to Morocco, Greek Islands and Mauritius! Single travellers welcome. See the windsurfing sailing conditions in this spot movie video of Palekastro in Crete. If you want to see what its like on a Jem Hall Windsurfing coaching holiday to Prasonisi, see this video from the archive. The Centre is Golf de Roses will be celebrating its 10th anniversary this year with events, beach BBQ and band. Join the party 18-20 May 2013 when the Kite Boarder Cross Tour Pro Am Event takes place - see here to sign up. Our new kitesurf centre has opened Dahab, Red Sea with rental of latest North Kiteboarding equipment, instruction, clinics and camps from UK pro rider & kitesurf coach Lee Harvey. PKRA 2013 starts in a few days in Dakhla, Morocco. See the latest news and video highlights from the 2012 event. Check out the new video from Sigri our newest flat water and wave sailing windsurf and kitesurf venue in the Greek Islands of Lesvos. COMPETITION TO WIN a place on the all new Kirsty Jones Kitesurf Camps in Dakhla, Morocco. Enjoy a weeks kitesurfing with yoga, surfing & SUP. INFINITY Board Hire Special Offer is the new windsurfing holiday deal for stays from 01 Feb to 30th June 2013. Pay for one day, play as long as you stay. The centre at Golf de Roses has a special rate for rental of windsurfing and kitesurfing equipment between 23rd March - 30 April 2013. When not windsurfing or kitesurfing in Sotavento enjoy the thrilling sport of Beach Sailing along the wide, sandy beaches of Fuerteventura in the Canary islands. Sign up for a week or try out for a day. Combine with a kitesurfing and surfing multi sport activity weeks holiday in this unspoilt part of Lanzarote in the Canary Islands. See the highlights video from the Fuerteventura Mens Slalom windsurf world cup at Sotavento in 2012. Right after the KSP Mauritius in 2012, the North Kiteboarding Pro Riders headed out to around Le Morne, in Mauritius to kite all the best spots. See the video here. Choice of 3 new tours to explore Vietnam including Hanoi, Hoi An, Ho Chi Minh City. 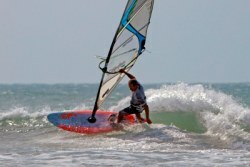 See Bill Kendall's report on Mui Ne Windsurfing after his Sportif holiday in Dec 2012. 8th International JP / NP Young Gun Camp at the Pro Center Christof Kirschner in Prasonisi. Probably the biggest and most popular youth windsurfing coaching event will take place this year from 3-10 August 2014 for your budding champions! Learn to Kitesurf at one of our 40 kitesurf holiday destinations with ideal warm water conditions. Flexible instruction programmes to fit your requirements from taster sessions, combi instruction + rental packages with ideal conditions. See this review and background information provided by event organiser Christof Kirschner - the founder and owner of the Procenter in Prasonisi, Rhodes on the 7th International JP / NP Young Gun Camp 4-11 August 2013. Jem Halls Reliable Rhodes clinics are selling like hot cakes with some weeks already full. The EFPT- European Freestyle Tour video report from Sigri, Lesvos from August 2012. Read all about Marsa Alam and the windsurf and sailing conditions in this article from the Windsurf Magazine archives on what sets this destination aside from the other resorts in the Red Sea. including instruction and all equipment. Head to Aruba in the Caribbean and compete alongside some fo the best windsurfers and kitesurfers with fun entry level events for all ages. Flights and hotel packages available - see the 2012 event video here. The season is from April to October with up to 70% windy days from F4+. Choose from luxury riads & spa hotels. Sportif offer the very best windsurf & kitesurf centres around the world. Windsurf Magazine Article on Gostoso, Brazil from March 2011 Archive by Rena ldo Scola. Photos by John Souville. See this Philippines Boracay resort report from Ant Baker, on the travel, accommodation and kitesurfing conditions. An article which reveals what makes this remote island the perfect get away from it all windsurfing venue. Combine two of the very best spots in the world - Jericoacoara & Icarazinho with a Combo Road Trip. Your chance to read another article on this windsurfing mecca. Article courtsey of Windsurf Magazine. Read this excellent article The Beauty of Rodrigues with Ian Leonard on the Boards press trip to Rodrigues. This place is a windsurfers dream.